No one wants to give up their independence while living at home, but sometimes the day-to-day tasks become more difficult to accomplish, requiring some home care assistance. Health Force, a licensed home care provider, has been assisting the elderly, frail and disabled population in Mercer and Middlesex Counties in New Jersey since 1996. With the opening of our second office in Whiting, New Jersey, we now extend our quality home care services to the residents of Ocean and Monmouth County, New Jersey. Our services allow individuals to age in place in a safe and independent environment. Our non-medical home care services range from minimal assistance to 24 hour/7 day a week care. Our services are provided on an as needed basis and do not require a written contract. Our staff is comprised of certified home health aides who provide personal care (ADLs), in-home companionship and homemaking services (IADLs) while non-certified employees provide only in-home companionship and homemaker services (IADLs). Our employees act as the eyes and ears for families who are not in close proximity to care for their loved ones. Health Force takes the time to carefully match each client with an appropriate caregiver to meet their needs. Sometimes care is needed more than just a few hours a day, especially in the absence of suitable caregivers. When live-in care is required or requested, Health Force will provide a compatible certified home health aide or non-certified employee, where applicable, who will live in the client’s home and provide in-home care each day. For safety reasons, 24 hour round the clock care may be necessary. Health Force can customize these services to meet your needs. Shifts generally consist of 8-12 hours. This service is best suited for clients who require frequent toileting, repositioning or who are at risk for falls or wandering. 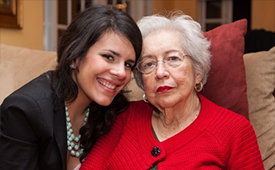 Family caregiving can be a stressful and demanding responsibility. Our in-home respite care services provide caregivers temporary relief and peace of mind knowing their loved ones are in capable hands. Qualified Health Force employees give caregivers that much needed break to prevent caregiver burnout which can take a toll on their physical and emotional health. Private duty care is available in nursing homes, rehabilitation centers or hospitals where our staff will assist individuals needing some extra personalized care. In an assisted living facility, Health Force can provide one-on-one care which extends an individual’s ability to remain in the comfort of their own home, delaying the need for nursing home placement. Since 1997, hospitals, rehabs, LTC facilities, psychiatric, developmentally disabled and VA homes in New Jersey have relied on Health Force for their interim staffing needs. Our services can fill the gap to avoid costly overtime or for last minute call offs, vacation coverage, extended leaves of absence and census peaks. Staff can be provided for monthly block scheduling or per diem shifts. All personnel are properly screened, credentialed and have at least one year of experience. Additionally, personnel are bonded and insured through the company professional liability and workers compensation insurance policies. Health Force assumes all responsibility for payment of employer taxes. "Our family would like to extend our thanks to Health Force for all you did to coordinate the exceptional caregivers that were assigned to Dante P. We so appreciated your kindness and professionalism."